Every year GDEX features some of the best speakers, sessions, workshops, and experiences of any event in the region. We select the most interesting and informative submissions and work directly with speakers to make sure they have an experience they can be proud of. Speakers are select on a rolling basis, so get your application in now! 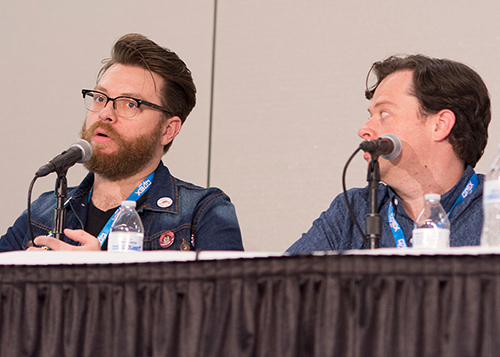 GDEX is proud to host some of the most informative, and fun workshops, panels, and presentations of any gaming event. GDEX is great platform to share your knowledge, story, and experiences with those eager to learn. Whether you are a AAA industry pro, a student, or an enthusiast looking to gain more experience, GDEX offers the opportunity for everyone to give high quality and professional presentations. Dev Day provides those looking for a deeper understanding of some of the industry’s most important topics. Workshops can be custom tailored for time, which will allow for a variety of formats that best fit the subjects. Audiences for Dev Day are expected to be at an intermediate to advanced level, so we are looking for instructors with real industry experience to present on this day. Dev Day is held the day before the GDEX showfloor opens, Friday October 11, 2019. We like to provide our speakers the ultimate GDEX experience as a thank you for being such a large part of our event. All speakers will receive an All Access Badge, which includes access to all of the special events, Dev Day, the all access lounge, and a T-Shirt. You will also have a personal GDEX representative that will help you with anything you might need during the weekend. Your GDEX representative will go over any additional information and benefits that may be part of your custom speaking package.